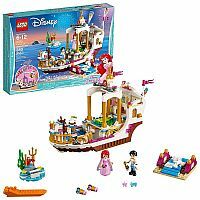 LEGO® l Disney Ariel’s Royal Celebration Boat has everything you need to play out a happy ending for Disney’s The Little Mermaid’s Ariel and Prince Eric. Dance on the revolving dancefloor under the gazebo, spin Sebastian’s starfish decks, discover secret treasure and launch the colored firework bricks. Get creative using the modular design of this great children's toy building set to easily move and swap sections within the model, or integrate the gazebo with other compatible LEGO l Disney construction toys to build your own dream creations. Includes 2 mini-doll figures plus Sebastian and Max LEGO figures. 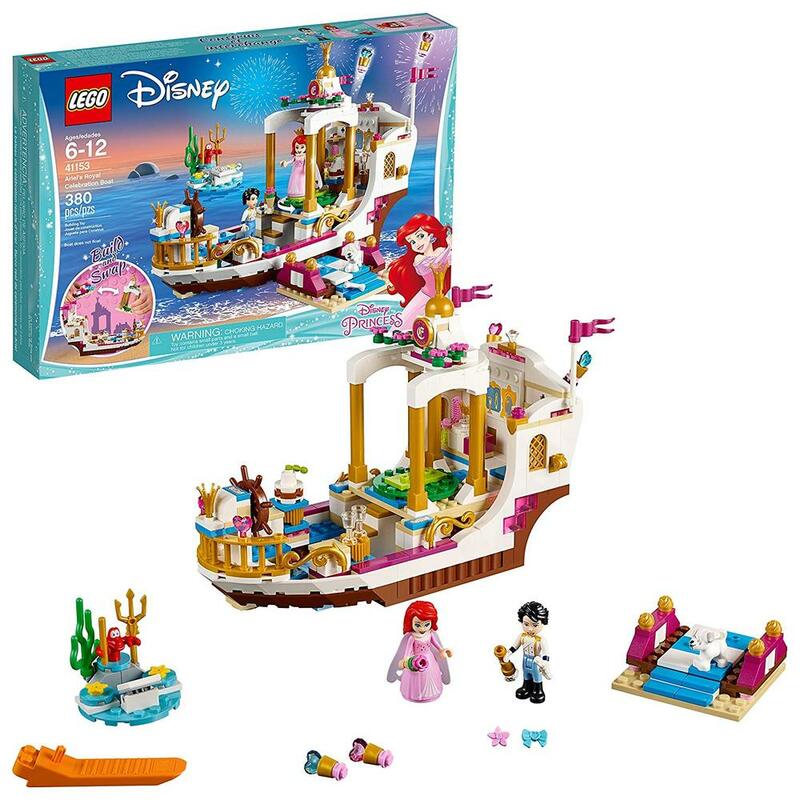 Includes 2 mini-doll figures: Prince Eric and Ariel with her dress and white fabric cape, plus Sebastian the crab and Max the dog LEGO® figures. Ariel’s Royal Celebration Boat features a gazebo with revolving dancefloor, ship’s wheel, vanity desk and firework launcher, plus a dock and Sebastian's island with turning starfish decks. Accessory elements include a cake, glasses, crown, treasure chest, jewel, telescope, Ursula's contract tile, trident, hair bow, bone, firework pieces and a perfume bottle. Customize this great children's toy building set by easily swapping and rearranging internal features such as the vanity, cake table and drinks table. Move and rearrange the gazebo and dock to customize the boat, or combine, swap and mix this model with other compatible LEGO® l Disney construction toys to build your own dream creations.